In this sixth edition of The Wandering Cheesemonger, our intrepid blogger, Grace, thinks about Cheddar cheese…. The other night, at dinner, I was talking to some friends about artisanal Wisconsin cheeses. One of them interjected, “Artisanal cheese? From Wisconsin?? What, do you mean cheddar?” They were expressing an attitude that I see frequently in Americans; this idea that there is no good cheese from the United States. Americans love our imported cheeses, and impressing friends with ‘exotic’ cheeses. I’ve said it before, though, and will keep saying it—there is SO much more incredible artisanal cheese on the platter (so to say) in the United States than most people realize. Although it makes me sad to hear people speak this way about American cheese, I totally understand where this idea comes from. Americans too often have little cubes of bland, plastic-tasting store-brand ‘mild cheddar’, or, even worse, a nice slice of Kraft Singles: American Pasteurized Prepared Cheese Product (we won’t even get in to why they have to call it a ‘cheese product’). I understand the desire to look down upon American cheeses, and there are plenty of American cheeses I will say ‘No, thank you’ to. However, the idea that cheddars in particular have to be bland is almost shocking to me, after growing up on Hook’s sharp cheddar (2, 5, 10, 12, and 15 year aged, as well as a 20 year limited edition that’s coming out soon!). So, I want to start making the case for cheddar. The first thing to understand about cheddars is that there are two main categories of cheddar: block cheddar and bandaged cheddar. Block cheddar is what we normally consume today, the stuff that can sometimes be bland and boring and plastic-y, but has the possibility to be one of the most punch-packing cheeses you’ve ever tasted. The reason this cheese is so varying is that it is packaged in large cryovac packs, so that the cheese ages very slowly. A cryovac cheddar that’s only a year or two old won’t taste like a lot, usually. However, cryovac is how star cheese makers like Tony Hook make star cheeses like Hooks 15 year cheddar. This cheese melts on your tongue while small crystals crunch between your teeth, and a tiny piece packs a huge amount creamy, strong flavor that lingers on your palate. Cryovac cheddar was only made possible in the past 50 years, since cryovac technology has been introduced to the food industry. Before then, all cheddar was bandaged, which means it was made in large rounds literally wrapped in bandages, and then aged (usually in a cave). 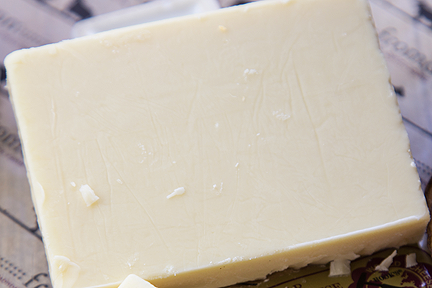 A cave aged bandaged cheddar can only age a few years before its flavor begins to decline, so a flavorful bandaged cheddar is usually around a year and a half to two years in age. However, bandaged cheddars have the advantage of absorbing some of the flavor of their surroundings—you can really taste the caves that they are aged in.